(From Pentax lens literature) The Pentax SMC P-FA 20mm f/2.8 lens offers outstanding versatility and is perfectly suited for architectural and outdoor photography. Weighing a mere 9 ounces, its compact and lightweight dimensions make it ideal for traveling. 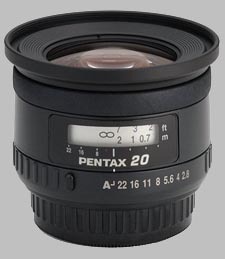 Like all Pentax lenses, the SMC P-FA 20mm f/2.8 wide-angle lens is treated with the acclaimed SMC coating for maximum light transmission, sharp definition, and high contrast while minimizing flare and ghost imaging. The Pentax 20mm f/2.8 SMC P-FA doesn't have any user reviews yet!